A "first look" is not just for the purpose of another photo opportunity, but also for a special secretive moment for the couple before the ceremony. Typically, the couple will find a secluded spot away from family and friends. The photographer will photograph the groom as the bride sneaks up from behind-ultimately both turning to face each other. There are benefits and downfalls to a First Look. One plus is the couple is able to have a moment to themselves, to settle their nerves and reconnect after a long morning of preparation. Another major benefit is saving time. Think about it- photos with family and the bridal party traditionally take place between the ceremony and the reception. However, maybe you cried during the ceremony and your makeup is no longer perfect. Maybe guests are being swept up in moving to the reception that you are unable to take photos with everyone. Maybe you simply will not have enough time in between! Planning the First Look two hours before the ceremony takes the stress of rounding up family and the bridal party for photos and gives you ample time to take photos with your partner. A lot happens on your wedding day-so when your hair and makeup is freshly completed, you are in a clear mindset, and you aren't expected to be in a million places at once is when you should do the bulk of your photos. Refrain from photos with guests that are not family or in the bridal party, and instead do these during your cocktail hour. You have to be a surprise to some guests! A downfall is, of course, your partner seeing you on your wedding day for the first time before the ceremony. As you walk down the aisle, the anticipation is not what it may be if you had not done a First Look. Not only will this take the surprise out of walking down the aisle for both the bride and groom, you will also have to be ready for the ceremony hours earlier. The groom and guests will all be part of the bride's entrance if the couple chooses not to do a First Look. 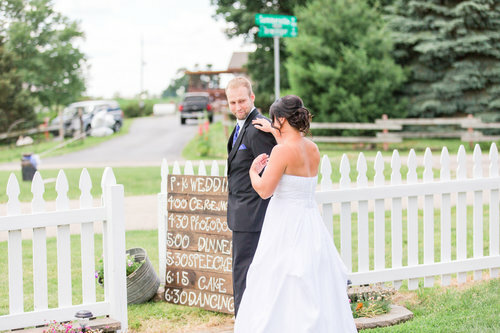 All in all, there are pros and cons to adding a First Look to your wedding day. It comes down to how you wish to manage your time, your values, and of course-whether or not you want the first time you see your partner to be in private or in front of guests. However, a First Look will not detract from the breathtaking moment for the groom or guests when the bride begins to walk down the aisle. What is your opinion? Have you either opted for or against a First Look on your wedding day? Comment below!